We offer two different types of tower lights: compact or modular tower lights. Choose the modular tower light when you want to be as flexible as possible and the compact tower lights when want a ready-to-use pre-assembled product. Both types can exactly suits the needs of your company. Our tower lights are available with diameter ranging from 30mm up to 70mm. Configure your individually tower lights of Modul-Perfect, Modul-Compete, Eco-Modul, Half-Dome, Modul-Compact or Modul-Signal or choose from pre-assembled signal towers instead. Our signal tower flagship PC7 meets the highest demands. The PC7 is the right choice when a future-proof, high-performance Signal Tower with many flexible options is needed. The cost-optimised CT5 has the same central contacting as the PC7, but was developed exclusively for 24V DC operation. For standard applications where high quality and an attractive price are required, the CT5 is the right choice. 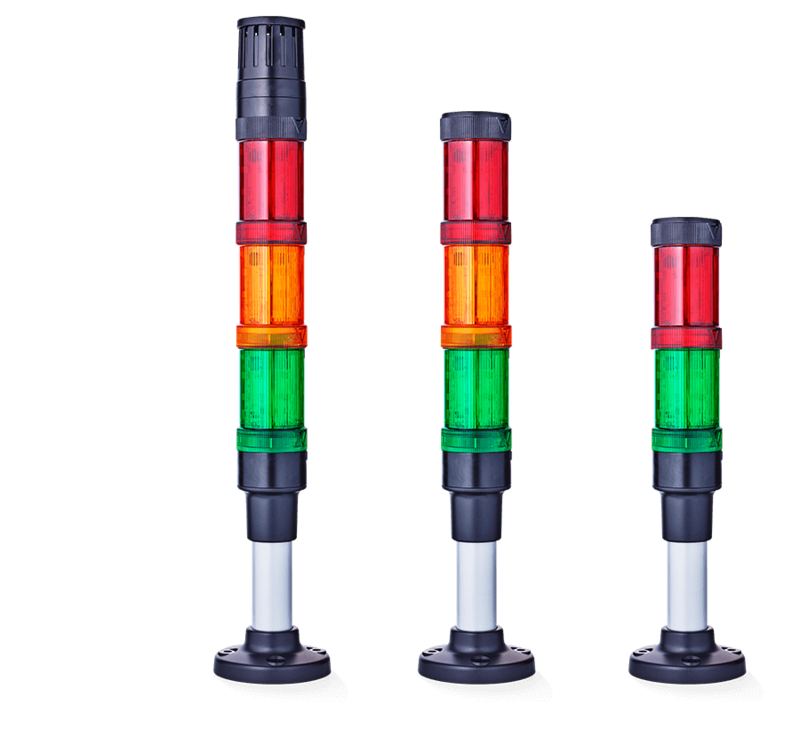 The standard signal tower series Eco-Modul is still equipped with classic contacting with metal pins, but also offers a complete product range in LED and incandescent lamp technology in three sizes. The ready-to-use LED signal tower is offered pre-configured or built to customer specifications and is available in two sizes – Ø 30 mm and Ø 70 mm. Perfect for large quantities. Very attractive price-performance ratio. Visual-audible LED signal tower in a semi-circular design for wall mounting. Optimal signalling due to 180 degree beam angle. Our modular signal towers are produced with unrivalled precision; the signal modules boast the lowest tolerance levels. Developed and built for many years of problem-free use in the industry. We produce signal towers for every application and in every common size: Ø 30 mm, Ø 40 mm, Ø 50 mm, Ø 60 mm and Ø 70 mm. Visual-audible LED design signal tower in a semi-circular design for wall mounting. Provides consistently optimal signalling due to 180 degree beam angle. Flexibility thanks to freely selectable colour combinations. With a diameter of 40 mm, our Eco-Modul 40 series is the smallest modular signal tower series available anywhere in the world. 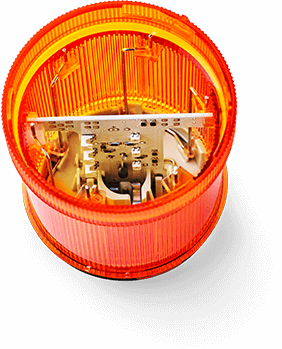 It is the only member of the Eco-Modul series to be equipped with an LED multi strobe or multi colour strobe. The pre-assembled, pre-wired and ready-to-use LED signal tower is manufactured according to customer requirements. Ideal if large quantities are required with a very attractive price-performance ratio. We have the right mounting solution, regardless of where the signal tower is to be mounted. Our quick mounting system saves electrical installation work and makes mounting extremely easy.